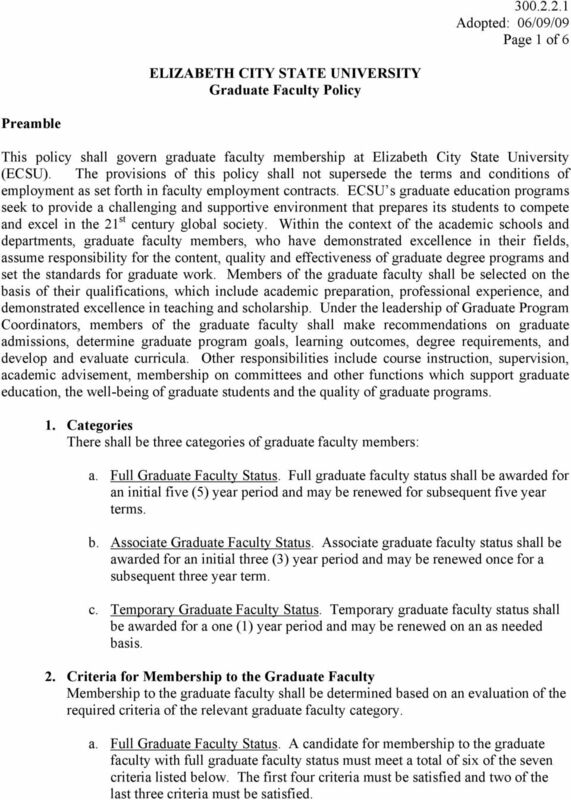 Download "ELIZABETH CITY STATE UNIVERSITY Graduate Faculty Policy"
1 Page 1 of 6 ELIZABETH CITY STATE UNIVERSITY Graduate Faculty Policy Preamble This policy shall govern graduate faculty membership at Elizabeth City State University (ECSU). The provisions of this policy shall not supersede the terms and conditions of employment as set forth in faculty employment contracts. ECSU s graduate education programs seek to provide a challenging and supportive environment that prepares its students to compete and excel in the 21 st century global society. Within the context of the academic schools and departments, graduate faculty members, who have demonstrated excellence in their fields, assume responsibility for the content, quality and effectiveness of graduate degree programs and set the standards for graduate work. Members of the graduate faculty shall be selected on the basis of their qualifications, which include academic preparation, professional experience, and demonstrated excellence in teaching and scholarship. Under the leadership of Graduate Program Coordinators, members of the graduate faculty shall make recommendations on graduate admissions, determine graduate program goals, learning outcomes, degree requirements, and develop and evaluate curricula. Other responsibilities include course instruction, supervision, academic advisement, membership on committees and other functions which support graduate education, the well-being of graduate students and the quality of graduate programs. 1. Categories There shall be three categories of graduate faculty members: a. Full Graduate Faculty Status. Full graduate faculty status shall be awarded for an initial five (5) year period and may be renewed for subsequent five year terms. b. Associate Graduate Faculty Status. Associate graduate faculty status shall be awarded for an initial three (3) year period and may be renewed once for a subsequent three year term. c. Temporary Graduate Faculty Status. Temporary graduate faculty status shall be awarded for a one (1) year period and may be renewed on an as needed basis. 2. Criteria for Membership to the Graduate Faculty Membership to the graduate faculty shall be determined based on an evaluation of the required criteria of the relevant graduate faculty category. a. Full Graduate Faculty Status. 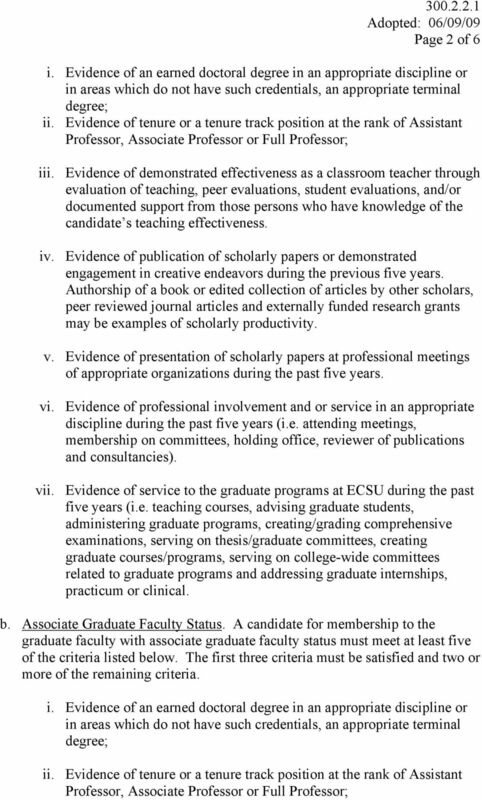 A candidate for membership to the graduate faculty with full graduate faculty status must meet a total of six of the seven criteria listed below. The first four criteria must be satisfied and two of the last three criteria must be satisfied. 3 Page 3 of 6 iii. Evidence of demonstrated effectiveness as a classroom teacher through evaluation of teaching, peer evaluations, student evaluations, and/or documented support from those persons who have knowledge of the candidate s teaching effectiveness; iv. Evidence of publication of scholarly papers or demonstrated engagement in creative endeavors during the previous five years. Authorship of a book or edited collection of articles by other scholars, peer reviewed journal articles and externally funded research grants may be examples of scholarly productivity. v. Evidence of presentation of scholarly papers at professional meetings of appropriate organizations during the past five years. vi. Evidence of professional involvement and or service in an appropriate discipline during the past five years (i.e. attending meetings, membership on committees, holding office, reviewer of publications and consultancies). vii. 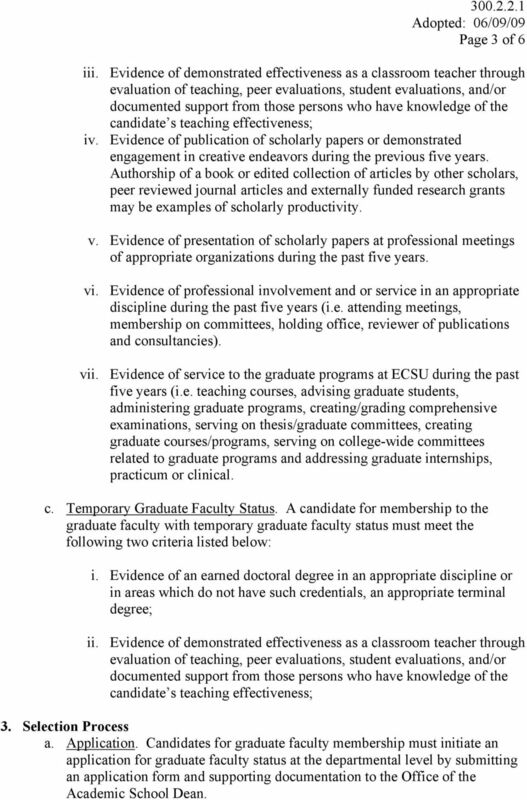 Evidence of service to the graduate programs at ECSU during the past five years (i.e. teaching courses, advising graduate students, administering graduate programs, creating/grading comprehensive examinations, serving on thesis/graduate committees, creating graduate courses/programs, serving on college-wide committees related to graduate programs and addressing graduate internships, practicum or clinical. c. Temporary Graduate Faculty Status. 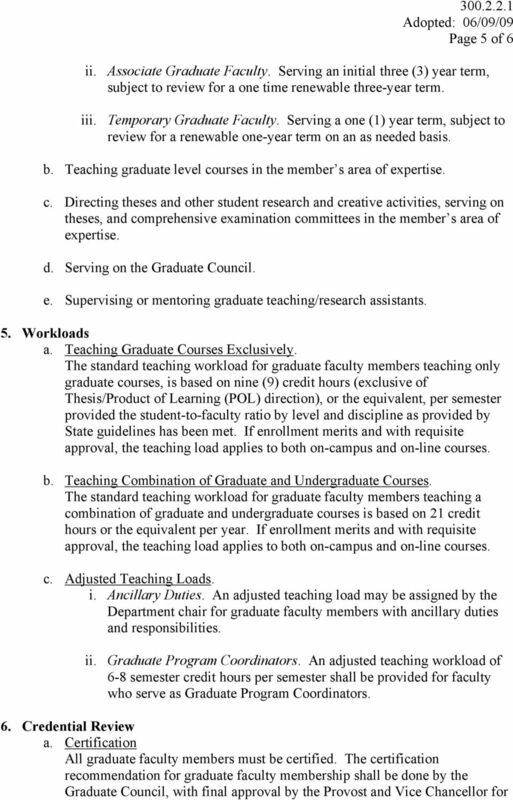 A candidate for membership to the graduate faculty with temporary graduate faculty status must meet the following two criteria listed below: i. Evidence of an earned doctoral degree in an appropriate discipline or in areas which do not have such credentials, an appropriate terminal degree; ii. Evidence of demonstrated effectiveness as a classroom teacher through evaluation of teaching, peer evaluations, student evaluations, and/or documented support from those persons who have knowledge of the candidate s teaching effectiveness; 3. Selection Process a. Application. Candidates for graduate faculty membership must initiate an application for graduate faculty status at the departmental level by submitting an application form and supporting documentation to the Office of the Academic School Dean. 4 Page 4 of 6 b. School/Department Review. Applications of candidates for graduate faculty status shall be reviewed by the Departmental Review Committee, comprised of full and associate graduate faculty and the Department Chair. If an application is recommended by the Departmental Review Committee and the Academic School Dean the candidate s application shall be advanced for further review by the Office of Graduate Education. If an application is not jointly recommended by the Departmental Review Committee and Academic School Dean, it shall not be advanced to the Office of Graduate Education for further review. A candidate shall be notified in writing if his/her application does not receive a joint recommendation by the Departmental Review Committee and Academic School Dean. c. Office of Graduate Education Review. The Office of Graduate Education shall review all applications advanced on the joint recommendation of a Departmental Review Committees and Dean and make recommendations to the Graduate Council for Certification. A candidate shall be notified in writing if his/her application is not recommended by the Office of Graduate Education for certification by the Graduate Council. d. Certification of Graduate Council. The Graduate Council is charged with certification of candidates for membership to the graduate faculty. The names and credentials of candidates certified by the Graduate Council shall be advanced to the Provost and Vice Chancellor for Academic Affairs for approval. If the Graduate Council does not certify a candidate for membership to the graduate faculty, the application shall not be advanced by the Graduate Council to the Provost and Vice Chancellor for Academic Affairs. A candidate shall be notified in writing if his/her application is not recommended by the Graduate Council for certification. e. Appeal. 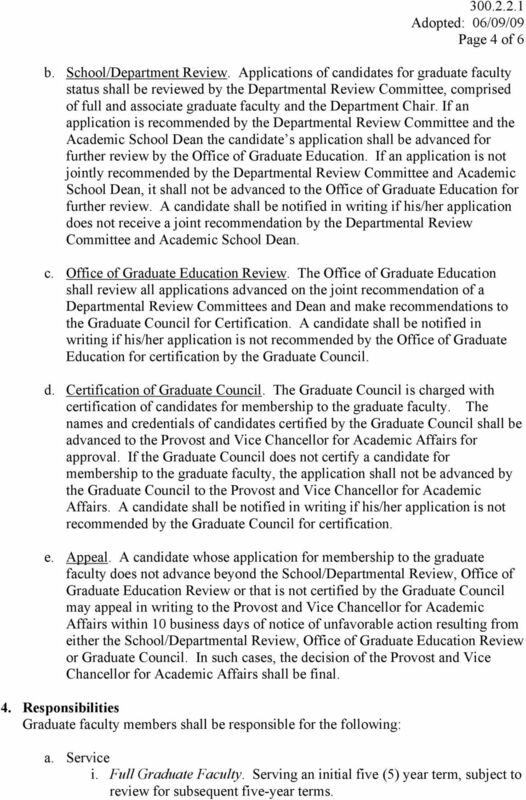 A candidate whose application for membership to the graduate faculty does not advance beyond the School/Departmental Review, Office of Graduate Education Review or that is not certified by the Graduate Council may appeal in writing to the Provost and Vice Chancellor for Academic Affairs within 10 business days of notice of unfavorable action resulting from either the School/Departmental Review, Office of Graduate Education Review or Graduate Council. In such cases, the decision of the Provost and Vice Chancellor for Academic Affairs shall be final. 4. Responsibilities Graduate faculty members shall be responsible for the following: a. Service i. Full Graduate Faculty. Serving an initial five (5) year term, subject to review for subsequent five-year terms. 6 Page 6 of 6 Academic Affairs. This certification shall be based on the candidate s demonstrated proficiency in scholarship, research or creative work, a high degree of expertise, service and the ability to make significant contributions to the body of knowledge in his/her discipline. 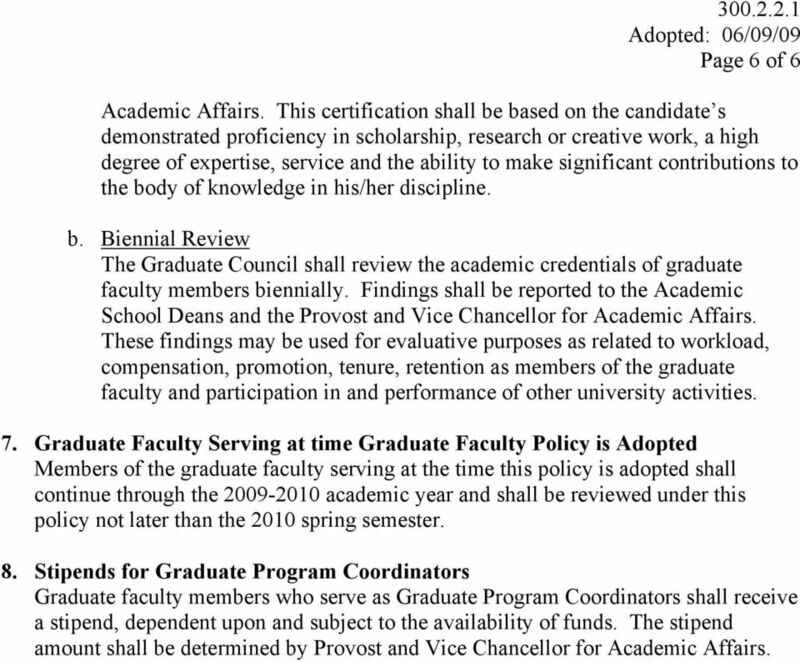 b. Biennial Review The Graduate Council shall review the academic credentials of graduate faculty members biennially. Findings shall be reported to the Academic School Deans and the Provost and Vice Chancellor for Academic Affairs. These findings may be used for evaluative purposes as related to workload, compensation, promotion, tenure, retention as members of the graduate faculty and participation in and performance of other university activities. 7. Graduate Faculty Serving at time Graduate Faculty Policy is Adopted Members of the graduate faculty serving at the time this policy is adopted shall continue through the academic year and shall be reviewed under this policy not later than the 2010 spring semester. 8. Stipends for Graduate Program Coordinators Graduate faculty members who serve as Graduate Program Coordinators shall receive a stipend, dependent upon and subject to the availability of funds. The stipend amount shall be determined by Provost and Vice Chancellor for Academic Affairs. The system-wide central MEES office will oversee the program.